Arnaud Greiner is a talented and passionate young man who has been working for other Jura producers for many years. He has also been making his own wine and has just made his second commercial release (we received a small supply of his first release in 2018). We are delighted that he has agreed to supply us with some of his miniscule production. 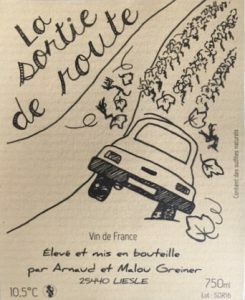 Arnaud and his partner Malou have a number of very small parcels of vines near the village of Liesle which add up to the grand total of a little less than one hectare. Each of the plots sit in a forest setting far from an agricultural sprays from the farms around the area. Some have great views over the valley. The photos below were taken on our first visit to Arnaud’s vineyards. This photo shows one of Arnaud’s small plots overlooking the village of Liesle. A tree that has been captured by one of Arnaud’s grape vines. Arnaud and Malou are certified organic by Ecocert. They do not use any sulphites in the production of their lovely wines. 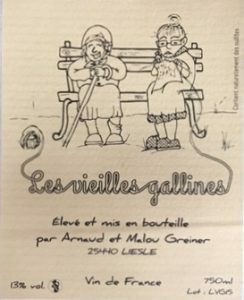 The wine labels are designed by the delightful Cecile Mouget who also acts as the translator for us. This lovely white wine is made from Chardonnay that was matured in a large 600 litre old barrel. The barrel allows some oxygen to seep through the wood into the wine thus protecting it for the future via mild oxidation. 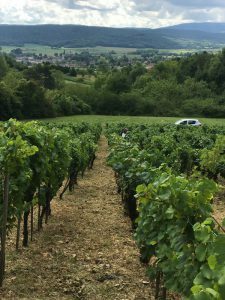 The vines grow on thick clay soil that is up to 40 centimetres thick and which has a bedrock underlay of limestone. We can testify to the fact that the clay is very heavy as we walked through this vineyard after a rain storm and it took ages for us to clean the clay off our shoes! The Chardonnay vines from which this wine is made are approximately 35 years old. 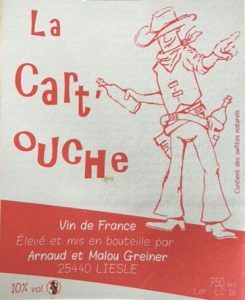 This is a very interesting wine made from four of the most common grape varieties found in the Jura, namely Pinot Noir (about 80%), Ploussard, Trousseau and Gamay (yes, Gamay has been grown here for a long time). The wine was matured in a 600 litre old foudre and was bottled in July 2018. This is a very savoury, light, flavoursome and very drinkable red wine with a beautiful streak of acidity which is very much in the style of Jura reds that are always light and easy to drink. This wine matches with a wide variety of foods ranging from charcuterie to roast chicken and just about everything else between. This wine is made from old vine Melon le Queue Rouge – hence allusion to age in the name. This wine is very fresh, yet very complex and rich and is a perfect match for a wide range of foods – in fact we often order a bottle of this variety and drink it right through a meal. Some people (including the official appellation body – the INAO) say that Melon is simply a variant of Chardonnay, however most of our winemakers in this region strongly believe that Melon is a different grape variety that acts differently to Chardonnay – and certainly tastes different. 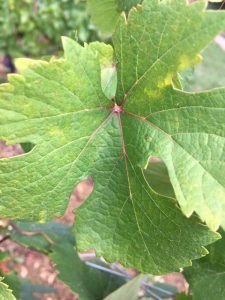 It is a smaller grape with thinner skin and is more susceptible to disease (which is why some growers don’t like it). This wine was matured in old barrels for a year and then moved to a fibreglass tank for another year to allow the solids to settle, thus avoiding the need to fine or filter the wine. The vines from which the Savagnin grapes for this wines were picked thrive in limestone soils that are responsible for the saline qualities exhibited by this wine. The first thing you notice when you drink this wine is the intense minerality. And no wonder! 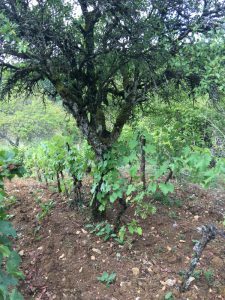 The vines on which the Savagnin grapes grow are over 80 years old and hence the roots have penetrated deep into the rocks below to extract the essential elements for the minerality experience. It is like sucking rocks! The wine has spent almost 2 years in old barrels before bottling. This is a brilliant example of a slightly oxidative white Jura wine. It has minerality, complexity and incredible flavours of hazelnut and spices such as fenugreek and curry leaf. 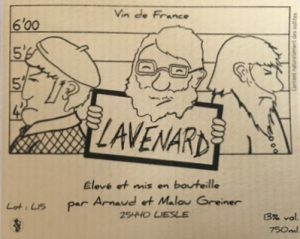 The label represents Arnaud’s neighbours in the vineyards who work the three that are closest to him. As you can see, they have been represented having their mug shots taken! We will only receive a tiny quantity of this wine.